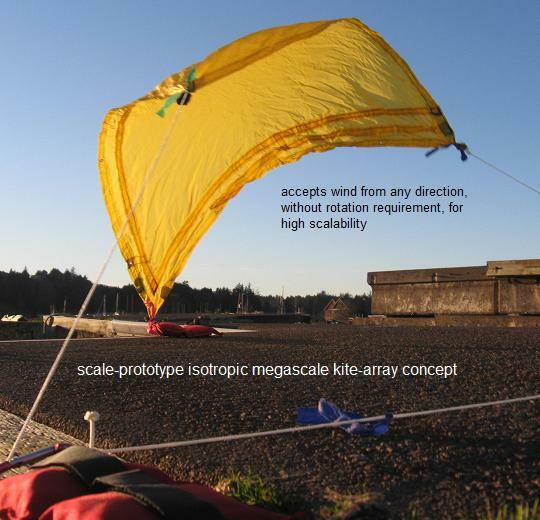 The megascale concept of a pure soft-kite isotropic wing was shown to work at meter-scale, but due to the crudeness of the untailored triangular playsail, it tended to luff. Next to test is common anti-luff solutions like reflex, ram-air battens, sawtooth turbulation, LE backpressure, and so forth. Then comes a motorized version able to fly persistently in calm by tilting in towed circles (or generate cross-wind power back-and-forth). If all goes well, scaling way up cheap and fast would follow. The ultimate giant versions would be low-solidity networks of soft-wing surfaces, with bridling and halyards to raise any kind of application payload, from energy to habitats. Guylines would maintain suspended payloads in place, as the overarching structure gambols about.